Connecting to an LDAP ID store in OAM 11g over SSL (LDAPS) is a common scenario that many customers may need to implement. Unfortunately the documentation on this subject is scant and can be misleading. So as part of the OAM 11g Academy series, I'd like to discuss this commom scenario. 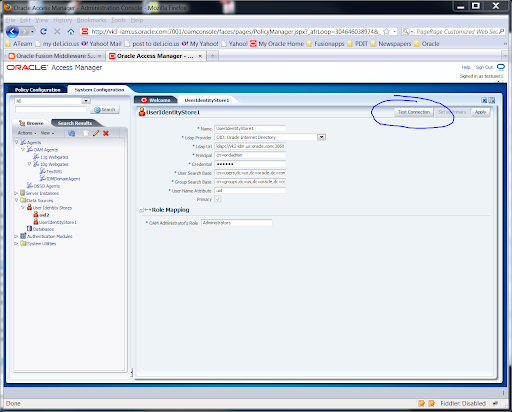 To view the first post on the OAM 11g policy model, as well as the index to the entire OAM 11g Academy series, click here: http://fusionsecurity.blogspot.com/2011/02/oracle-access-manager-11g-academy.html. The URL for the LDAP host, including the port number. You can also specify ldaps://, which supports SSL_NO_AUTH. So what does it all mean and what do I do if the LDAPS connection fails? SSL_NO_AUTH basically means a self signed certificate, no authentication required. 1-way and 2-way SSL modes are not supported at this time. 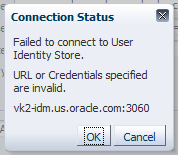 This specific exception states that it cannot find the certificate in order to initiate the SSL handshake. Fortunately the solution is pretty simple and has two parts. First, OAM now uses the Java Key Store (JKS) format to store the certificates keys. OAM uses the JKS file 'cacerts' located at "$JAVA_HOME/lib/security/cacerts". This is where the certificate needs to be imported into. Secondly, make sure that the right certificate is imported via the keytool. For more information on how to use the keytool, you can go here. You will need to import the server certificate along with the CA Root cerficate into the keystore. Many customers make the mistake of importing only the CA Root certificate. 1) The difference from 10g, is that 11g now uses the default 'cacerts' location based on the $JAVA_HOME directory. 2) Make sure that both the CA Root certificarte and the server certificate (child) are imported into the keystore. It looks like the first graphic in this post is cut off, I need to look into this. So FYI, the 'Test Connection' button is located on the top right hand side of the page. I was able to able to connect directly via a java client using LDAPS. So it seems to me that the certificate import should have resolved the issue. What do you see in the OAM diagnostics logs? Do you see the SSL handshake error? If so, there is still an issue with the certs you imported into cacert. Make sure that the cacert is in the same $JAVA_HOME that OAM is using, which in my case was under the Middleware home directory. I finally got things to work by installing the certificate in the Demo Trust store (wlserver_10.3/server/lib/DemoTrust.jks). We are running WL in production mode, and I would have expected that installing the cert in any of the two trust stores should be sufficient. However that does not seem to be the case. We are using WL 10.3.5 and OAM 11.1.1.5.0.